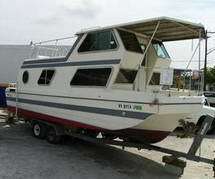 Never heard of a Steury Houseboat? What better than photo's and details! A Steury Houseboat can sometimes have been classified as small trailerable houseboats, yet they provide style, functionality, and large enough to sleep a few people in comfort. I guess you could say "small houseboats" with a big feel! Great for those weekend fishing, or boating holidays. This website is constantly being updated with new pages & information, so be sure to join our free Magazine-Newsletter, it's your great resource. Is a Steury a Trailerable? A little history about them, they were known for their boats, and travel trailers, and ChrisCraft bought the Steury Company in the 70's. The Steury houseboats made, appear to be in the 1970's and in the early 80's. Raised pilothouse, and many windows. A good galley and layout for a couple. 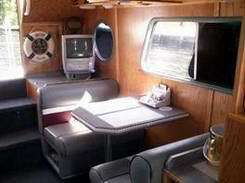 Are Steury's small trailerable houseboats? The Steury houseboat is a fiberglass tri-hull design of @ 23feet in length, 8 foot beam with a two level roof deck for relaxing. Having a good view from a raised pilothouse design, front & rear deck, a galley, a head, and ample storage for a couple looking to getaway for weekends. One of the primary advantages to small houseboats, or should I say "small trailerable houseboats" is that they're very easy to trailer or transport from one location to another. So with a truck, or a big SUV you could trailer it and find all those secluded dream lakes begging to be explored. 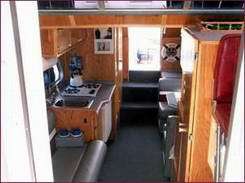 They generally came with 120v-12 volts lighting, and most with 120v-12v-propane fridges, stoves, and inboard engines. You'll find many Steury House Boats that have been converted to Outboard engines, thus freeing up extra storage in the engine compartment. Depending on the engine, you could cruise anywhere between 5-6 knots, to a fast planing speed of @ 20-25 knots, plenty fast to get back to the marina, your favorite fishing spot, or across the lake. 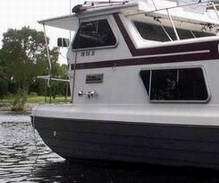 Thinking of Buying a Used Steury House Boat? 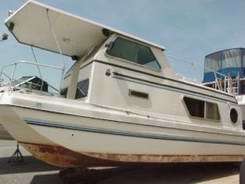 You're contemplating buying a Steury, like any boat, I would recommend a Marine Survey to verify the condition and value before closing a sale. Looking for an alternative, you might be interested in other Manufacturers of Trailerable House Boats like Catamaran Cruisers, Travelwave, Adventure Craft, Nomad, Lil'Hobo are some of the common brands found. Contribute and Share your story. If you happen to own a Steury House Boat, and you have pictures, some history, or more details that you can share with the readers, you can use this link to share it with our readers. They would love to read about it! A dining, or transform to a sleeping area. Roof overhang provides a good dry view. Return to the Top of the Steury Houseboat page.